We are proud to announce that the Mountsorrel Railway Project has won a prestigious Diamond Jubilee Award for outstanding contribution to the community! The award was setup by Leicestershire County Council to honour community groups within the county who have come together to demonstrate community spirit to help their local area. 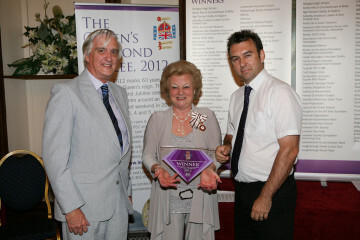 The award was presented by Lord-Lieutenant of Leicestershire Lady Gretton, at a special ceremony at Beaumanor Hall on Thursday evening. “It is a fantastic honour for us to receive such prestigious recognition for the work we are doing.” said project leader Steve Cramp. “The award recognises not only the historical preservation work we are doing at the Mountsorrel Railway, but also our many initiatives to protect and encourage the ecology alongside the route and the way we have brought the community together”.